Imperial Prussian Feldkompanie in all of their Teutonic Glory. They are organized for the Soldiers Companion rules. The command figure are on slightly larger bases. Okay…when I decided to organize my Imperial Prussian forces, I wanted to use their historical organization. The Imperial Prussian Army’s basic building block was the infantry battalion of approximately 1,000 men divided into four companies of 250 men each. Why such big companies? Well, according to my sources, it was because the larger companies could more readily absorb combat losses and keep fighting. Since I have a large collection of early WWI figures already painted up, it was no problem fielding a full strength Imperial Prussian Feldkompanie. Here they are in all their Teutonic Glory! They are mostly Battle Honours figures with a couple of Pulp Figures as well as a Paroom Station miniature as the company commander. 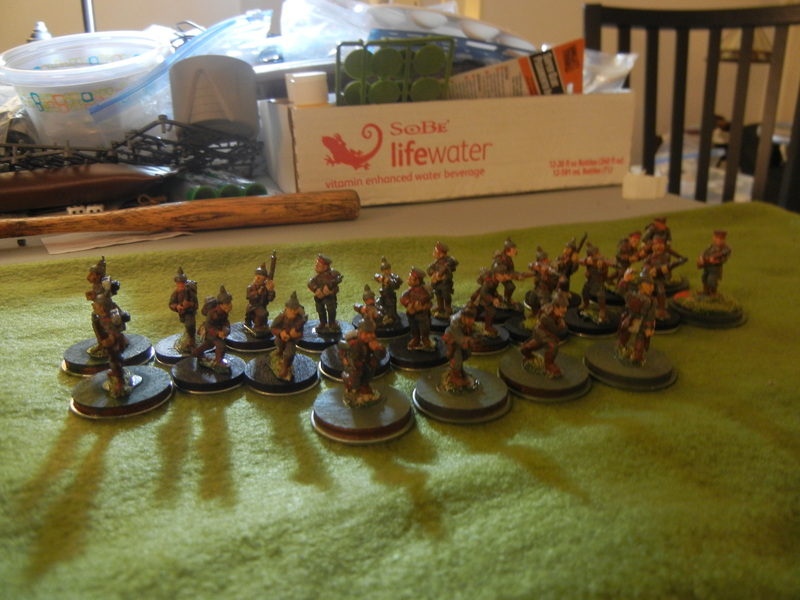 After I paint up a few command figures, I should have enough soldiers to form up a second Feldkompanie! Let the Kaiser’s enemies beware!